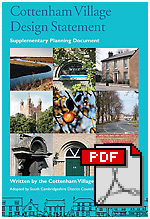 All planning applications for Cottenham are viewed by the Village Design Group. Where appropriate comments are submitted to South Cambridgeshire District Council by two members of the Group. Copies of these comments are also sent to the Parish Council and deposited in Cottenham Library. These comments assess applications in relation to the principals set out in the Village Design Statement and adopted by the District Council as a Supplementary Planning Document. Members draw on their local knowledge and experience to interpret these principals. The aim of this process is not to prevent change, although we do sometimes object to applications, but to enter a positive dialogue with the aim of producing better developments. This process also helps the group to monitor changing trends in planning and to assess the effectiveness of the Design Statement in relation to these. View the full code of conduct for planning comments. Subject to conditions, the Group may also agree to respond to requests for informal advice.